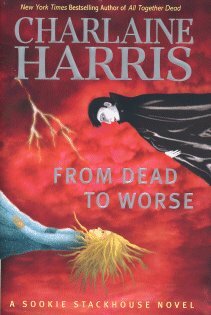 I finished reading From Dead to Worse (Southern Vampire Mysteries, No. 8 ) . In this book Sookie is fending off her vampire ex-lover, Bill, and her blood-bonded pal, Eric. Sookie is distraught over the recent lack of communication from Quinn, her Weretiger boyfriend. A violent Were power struggle erupts as Vegas vampires attempt to take over Louisiana from disgraced queen Sophie-Anne. Sookie’s finally meets with her fae great-grandfather, Niall Brigant, which paves the way for a shock ending that will delight longtime fans. This book has more plot and less romance crap getting in the way than some of the other books. It was a fun quick read.